The Quilt Ladies Book Collection: Master Just about Finished??? Well, our master bedroom is about done....maybe.....? There is a headboard on the left? 50's lamps for the nightstands and then I think I'm done? 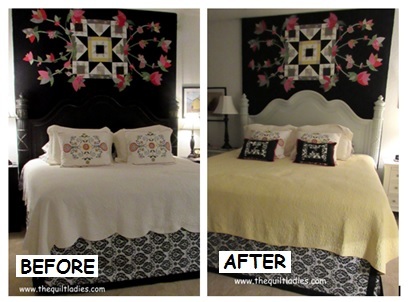 the Black and White with Red edging Pillows Quilt Pattern is HERE for you !